At the podium, Ed Mullins, president of the NYPD Sergeants Benevolent Association, flanked by big city police union presidents from around the country. In New York City, the Sergeants Benevolent Association (SBA) is fighting back hard at what they say is the latest travesty of justice suffered by Sgt. Hugh Barry at the hands of corrupt politicians. Sgt. Barry was recently indicted for murder for mortally wounding an emotionally disturbed person who attacked him with a baseball bat in the Bronx in October, 2016. 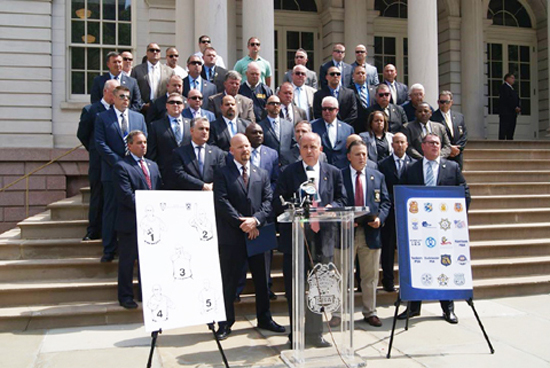 As soon as the word went out that the SBA scheduled a press conference on the indictment, police union leaders from Los Angeles, San Jose, Oklahoma City, San Francisco, Omaha, Miami-Dade County, Chicago, New Jersey and many other states and municipalities flew to NYC to stand behind their brothers and sisters from the NYPD in support of Sgt. Barry. Representatives of the Los Angeles Police Protective League, San Jose Police Officers’ Association, Oklahoma City FOP, and the Chicago FOP all spoke at the event.